A Catholic approach to History, this program is designed for teaching several children of varying ages at the same time. Through the use of time lines, map activities, hands-on projects and research assignments, the complexities of history and geography are broken down into manageable parts. The laminated Wall Chart of Western Civilization and the sixty laminated History Cards are color-coded for easy recognition. The 2001 edition features a spiral-bound parent manual with more than 150 daily lesson plans. Also included are two introductory CD's, forty historical map masters, patterns and directions for making five medieval flags, ten history tests and answer key. This program is NOT self-contained, but requires numerous outside resources for reading and research. A complete list of texts is provided in the manual. Student maps and worksheets are reproducible for classroom or family use. Ages 10-17.
eight new medieval flag patterns. (This is the original version of Level B. Many, but not all, lessons are broken down into daily assignments and many include suggestions for both older and younger students. Ages 10-17. Key for study text book questions. 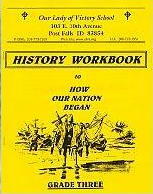 An upper-elementary U.S. History text by Fr. Philip Furlong that begins with Columbus and ends in 1939. Paperback. Black and white illustrations. Ages 10 - 13. By Rev. Philip Furlong. A History text of Western Civilization for upper-elementary students. Covers Egypt, Greece, Rome, coming of Christ, Christianization of Europe, Middle Ages, Renaissance, discovery and settlement of the New World. Ages 10 - 13. Answer Key to above text. Paperback. A workbook and study guide for the above text by Belinda Mooney. Exercises and questions provide review, organizational charts help students understand and retain the information. Multiple choice, true/false and matching exercises may also be used as tests. Paperback. Key included. A high school history text by Anne Carroll. The 26 chapters cover from pre-Columbian times to the 1990's. Includes chapter review questions and suggested projects and research topics. Ages 14-16. At last a workbook for students to use along with Anne Carroll's Christ and the Americas. The workbook helps the student in mentally processing a large amount of information and grasping the major historical concepts as well as names, places, dates and events. Then, with the answers filled in, the questions become a great study guide and memory aid. A good survey of Church history in less than 200 pages. Includes maps, charts, timelines, black and white illustrations and brief biographies of key persons. Helpful timeline charts. Paperback. Ages 13 and up. Reprint of a 1935 text book for upper elementary and high school students. Begins at the first Pentecost and continues to 1935. Black and white illustrations. Paperback. Ages 12-17. A practical tool for review and practice to accompany the Bible History text above. Includes matching exercises, fill-in-the-blanks and more. Paperback. Ages 12-13. By Father John Laux. A high school text presenting the true meaning of inspiration, guidelines to understanding the Bible and the Church's role as the Bible's official interpreter. Also gives an introduction to each book of the Bible with well-chosen Scriptural passages from most of the books that render a representative example of what they are like and about. Roman history from 753 B.C. to A.D. 476. Six-foot full-color timeline gives pictures, dates, and brief descriptions of the major persons and events in ancient Roman history. The back of the time line offers further information, activities, map and pictures. A complete unit study. From 5,000 B.C. to 331 B.C. Six-foot full-color timeline gives pictures, dates, and brief descriptions of the major persons and events in Mesopotamian history. The back of the timeline offers further information, activities, map and pictures. A complete unit study. From 1607 to 1791. Six-foot full-color timeline gives pictures, dates, and brief descriptions of the major persons and events in colonial America. The back of the timeline offers further information, activities, map and pictures. A complete unit study. From 1619 when the first slave ship comes to America, to April, 1865, the end of the Civil War. Six-foot full-color timeline gives pictures, dates, and brief descriptions of the major persons and events surrounding the Civil War. The back of the time line offers further information, activities, map and pictures. A complete unit study.